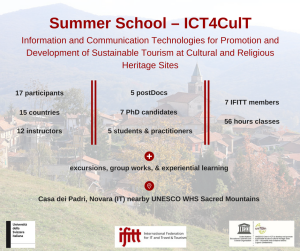 In 2016 IFITT partnered with the UNESCO chair in ICT to develop and promote sustainable tourism in World Heritage Sites established at USI – Università della Svizzera italiana (Lugano, Switzerland) to organize its Doctoral Summer School. IFITT DSS coincided with the first week of the two-weeks Summer School of the UNESCO chair. IFITT members can apply for a scholarship to cover the tuition fee (175 euros for one week or 350 euros if they participate to both weeks), while board and lodging are at own expenses. Please find here instructions on how to apply for the scholarship. Please find here the presentation of the Summer School with all related info.